He was detained in Bologna in the summer of 2017. 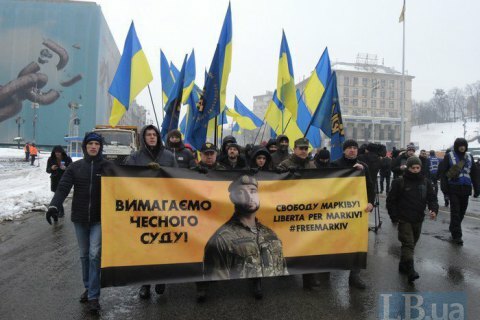 A rally in support of National Guard member Vitaliy Markiv arrested in Italy has been held in Kyiv's Independence Square. According to an LB.ua correspondent, around 100 people, including members of Markiv's Gen Kulchytskyy Battalion, attended the rally. They were holding the flags of Ukraine and the battalion and a banner saying "We demand fair trial". They called on the Italian judiciary to change a measure of restraint for Markiv and acquit him. They walked from the assembly point in Independence Square to the Italian embassy. Markiv was detained in Bologna in the summer of 2017 on suspicion of premeditated murder of Italian journalist Andrea Rocchelli from a mortar near Slovyansk on 24 May 2014.The Ukrainian Prosecutor-General's Office says he could not do this because the National Guard did not have mortars at all at the time. The area was not controlled under the Ukrainian government and Rocchelli was there without seeking permission from the Ukrainian authorities.